Artists’ studios aren’t generally thought of as meditative places. The stereotype is one of disarray—an image comes to mind of paintbrushes, sculpting tools, or other instruments of the trade strewn about a room, as if to signal an unruly creative process. But the studios of certain mid-20th-century Los Angeles artists were actually quite Zen. After World War II, California, with its history of tolerating unorthodox belief systems, was especially open to the influence of Zen Buddhism, in which meditation plays an important role. As Buddhism moved into the mainstream, L.A. painters and ceramicists found in it a wealth of ideas for their art. Painter John McLaughlin, for instance, took a decidedly Buddhist approach to his work: he strove to take himself out of the picture. 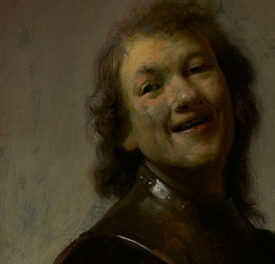 He was known to quote a 15th-century Zen painter’s principle of ma, the “marvelous void.” Ma—a spatial emptiness that provides an essential focal point between two objects or subjects—is evident in his painting shown above, which consists of two black horizontal lines bordering the edge of an open white field. 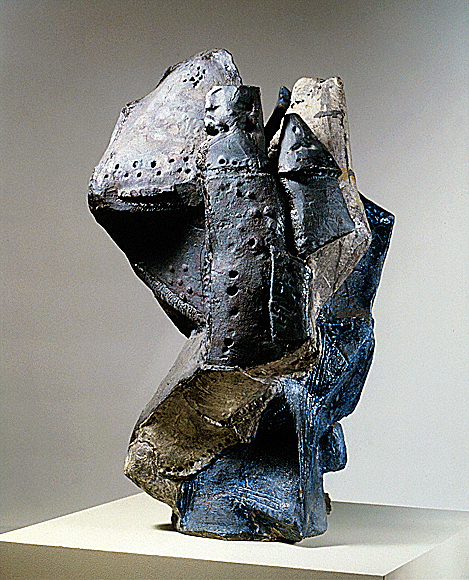 Zen also exerted an influence on the ceramics studio of the Otis Art Institute, directed by Peter Voulkos. At one point, the head of the Otis design department kidded Voulkos about all the books on Zen lying around, joking that the “whole shop was going Zen.” The next day, labels had blossomed on every object: “Zen” water faucets, “Zen” chairs, “Zen” clay. The asymmetric, abstract, and innovative paintings and ceramics created by Voulkos, McLaughlin, and other Zen-inspired artists—several of which are on view in the exhibition Pacific Standard Time: Crosscurrents in L.A. Painting and Sculpture, 1950–1970—are worth contemplating. Adapted from a sidebar written by the Getty Research Institute’s Pacific Standard Time curatorial associate Catherine Taft. Read more about “Zen in the Studio” in the new book Pacific Standard Time: Los Angeles Art, 1945–1980. I believe the bigger the mess, the greater the genius! As long as the maelstrom INSIDE your mind helps effect your own personal Zen-like state of creativity, what’s OUTSIDE it can obediently take on an almost fractal-like curvature that reflects & completes the process. Are my meditations & surroundings shaped to match what someone else says should work, or what my own experience tells me? Experiment, experiment! Enjoy your play. You might be changing the world with your every thought.